 The“Wind Griot” award for The Best Feature Film. This award is worth 15.000€ and includes the trophy. 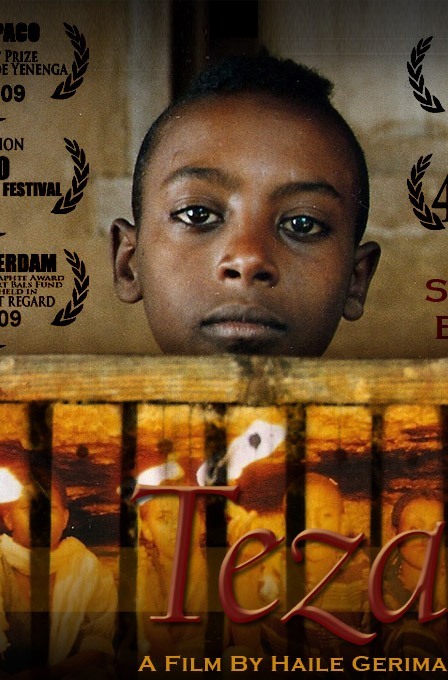 For the TEZA (Dew) directed by Haile Gerima (Ethiopia, Germany, French). For its capacity to reflect the history of the whole African continet through the great script, exceptional actor´s performances and mature direction.  Griot of Clay, award for the best full-lengths film director. This award is worth 10.000€ and includes a Trophy. For the director CAROLINA KAMYA (Uganda, Sweden) and her movie Imani (The Faith). For its fresness and subtlety, which manifests the capacity of the new generation of African filmmakers to express their vision of the world. worth 2.500€ and includes the trophy. The award is donated by FRS – Fast Ferry Service Company, which operates ferries in the Strait of Gibraltar. For the REHEMA NANFUKA for her part of Mary in the movie Imani (The Faith) (Uganda, Sweden). For her gentle and congenial interpretation of a women trapped in difficult live situation.  The award for the best actor in full length feature film. The award is worth 2.500€ and the trophy. For the actors KEN AMBANI, ABUBAKAR MWENDA y GODFREY ODHIAMBO for their parts in the movie From a whisper (Kenya). For their collective and congenial work, which enables to viewers really feel the internal conflict of the society torn by terorrism. For the movie ATLETU (The Athlet), directed by Rasselas Lakew and Davey Frankel (Ethiopia, USA, Germany). and for the movie EHKI YA SHAHRAZADE (The Women from Cairo), directed by Yousry Nasrallah from Egypt. – The “Ebony Griot” Award for the best documentary. The award is worth 10.000€ and includes trophy. The award is donated by Casa Africa. For the movie LES LARMES DE L’ÉMIGRATION (The Tears of the Emigration) directed by Alassane Diago (Senegal, France). For the intimate reflection of the universal problem in the local African context, which was conveyed by superb and highly cinematic direction.  The RTVA Award for Audiovisual Creation. The award is worth 1.500€ and includes trophy “El Dilema”. The award also means that RTVA (Andalusian Radio and Television) will support the film by buying its broadcasting rights. The award is sponsored by Cajasol-Obra Social. For its close reflection of the daily routine, which can exist in whatever place or culture in the world and for the delicacy with which demonstrates the religious intolerance and new masks of the old colonialism. The Youth Jury, formed by the Andalusian Youth Institute (IAJ), votes the award for the best short film. The award is worth 2.000€ and includes trophy. For its profound capacity to arouse audience emotions through his developed artistic symbolism.